Donna Pressma has been President and Chief Executive Officer of The Children’s Home Society of New Jersey (CHSofNJ), Trenton, NJ since 1986. In 2018, CHSofNJ has a budget of $20,000,000 and a staff made up of 300 multi-disciplinary professionals including clinical social workers, school based youth workers, early childhood specialists, nurses, WIC nutritionists, and Head Start teachers. CHSofNJ is a statewide not for profit agency with a board of 18 trustees. The agency founded in 1894 and now serves every NJ County with community based services. In 2016-2017 CHSofNJ served 79,000 infants, children, youth, parents and grandparents with services in child welfare, behavioral health, school based, early child care, maternal child health, head start, and kinship. 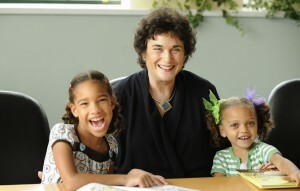 Ms. Pressma was previously CEO of the Jewish Family and Children Agency of Philadelphia, CEO of the Jewish Children’s Bureau of Chicago, and she oversaw the child welfare services for the State of Connecticut under Governor Ella Grasso. Ms. Pressma has a Bachelor of Arts in Psychology from Antioch College and a Masters of Social Work from Smith College. She completed her Master’s Thesis (published) research at the Massachusetts Institute of Technology. She is a New Jersey Licensed Clinical Social Worker. Ms. Pressma represents CHSofNJ, a member agency of the Child Welfare League of America (CWLA), Washington, DC. She chaired their National task Force on Child Care and in 1988 initiated and chaired their National Task Force on Children and HIV Infection. She testified to United States Congress and helped secure funding of the Ryan White Act along with Senator Metzenbaum, Surgeon General C. Everett Koop and Dr. Norman Orleski. She was a member of the New Jersey Child Welfare Transition Policy Group for Governor Jon Corzine. In 2013 she was the awarded the National David Roth Leadership Award by the Child Welfare League of America. Ann Massa is our new Second Vice President of Preventive and Family Outreach Services supporting Maternal Child Health and Family Support Services. Ann brings over 20 years of successful leadership, clinical education, and nursing experience within Maternal Child Health and Pediatric Health Environments. Ann graduated from Thomas Edison State College with a Master's Degree in Nursing Education. She is further credentialed as a Registered Nurse, Certified in Maternal Newborn Nursing from the National Certification Corporation.